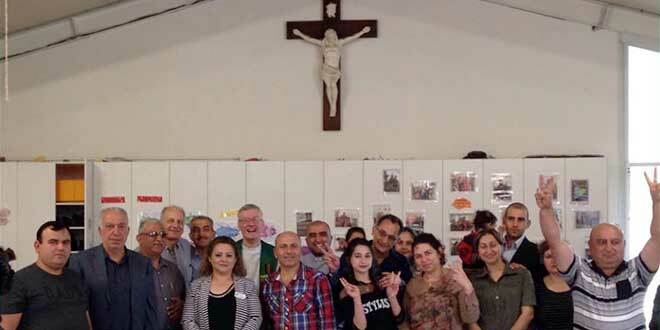 Joyful: St Joseph’s and St Anthony’s Bracken Ridge parish priest Fr Gerry Hefferan with celbrating Iraqi parishioners. BRISBANE’S Iraqi Christian refugees have joined worldwide celebrations as US-backed Iraqi forces regain towns and cities across northern Iraq, driving out Islamic State militants. Prayers, feasting and dancing accompanied news that Iraqi troops had taken back Qaraqosh, the mainly Christian town about 20km south-east of Mosul. “We are very excited, very happy,” said Kareem Patros, from the Parish of St Joseph and St Anthony, Bracken Ridge, where Iraqi parishioners celebrated the “new peace” with morning tea following Mass last Sunday. Two days earlier as the first news filtered through of the liberation of Qaraqosh, the Bracken Ridge Iraqi community came together to pray in Arabic and Aramaic for the safety of their families and communities as the bombardment of northern Iraq continued. More than 50 Iraqi families living in Bracken Ridge and nearby suburbs have arrived only in the past few months. Their exodus from Qaraqosh and other Christian towns on northern Iraq’s Plain of Nineveh began in 2014 after IS jihadists stormed the region. Qaraqosh was home to 120,000 Christians. In Iraq, Christians including Chaldean, Assyrian, Armenian and Syriac communities, once numbered more than a million, with upwards of 600,000 in Baghdad alone, but there are now fewer than 350,000 in the country. Many spent months, some years, living as refugees in Jordan and Lebanon before being granted humanitarian refugee visas to stay in Australia. “Qaraqosh is now empty. There is nothing left,” Mr Patros said. “IS (Islamic State) did terrible things. They bombed our church, even took the cross from the top. I cannot even talk about the things that they did. Mr Patros fled Qaraqosh in 2002 during Saddam Hussein’s rule of terror. He and his wife Bushra have been instrumental in assisting the latest wave of Iraqi refugees. He said more Qaraqosh families were expected to arrive in Brisbane in the next few months. Mr Patros is excited because his sister, older brother and his nephews had received refugee approval and were due to touchdown in Melbourne this week. He said Iraqis are grateful for the chance to start a new life, and in Bracken Ridge, they were being enthusiastically accepted by parishioners and the local Catholic schools. Mr Patros said many of the men from Qaraqosh were professionals – including doctors and engineers – and would find work once they had completed their initial English studies through TAFE courses. St Joseph’s and St Anthony’s Bracken Ridge will hold another prayer vigil for the people of Iraq and Syria on Friday, November 4 at 7pm.